A growing number of Chromebook devices – laptops that use Google’s Chrome OS – have been launched over the past 24 months with a clear focus on the enterprise market. Starting from the education vertical where their reasonable price, ease of rollout, low maintenance overheads and almost non-existent learning curve allowed Chromebooks to steal market share from Mac and Windows, Google now wants businesses to follow suit. And it is counting on products such as the Acer Chromebook Spin 13 (and its own Google Pixelbook) to do the trick. 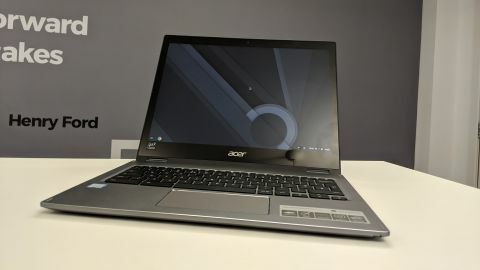 It is worth noting that the Chromebook Spin 13 (CP713) sits in Acer’s professional portfolio rather than its consumer range. The Spin 13 model that we received retails for just over $855 (around £670) direct from Google. A cheaper model, powered by a Core i3 CPU (as opposed to a Core i5) is also available with the exact same configuration otherwise. Acer chose to follow Google’s lead and adopt a 3:2 aspect ratio for the display, which in turn has an impact on the overall form factor, especially once the large bezels are factored in. It is a relatively big laptop at 1.5kg, with a footprint of 310 x 246mm and a thickness of 18mm. All the design features you’d expect from a high-end product are here: Gorilla Glass for the touchscreen and the touchpad, diamond-cut edges, an anodized aluminum chassis which gives it a premium finish and helps with power dissipation. We were not so keen, though, on four aspects of this Chromebook: the display – which is connected to the body via two hinges – is not 100% oleophobic (meaning it does collect fingerprints), and there are four small rubber strips located on the four corners of the base unit, plus there’s a tiny ‘lip’ to help open the cover rather than the tried-and-trusted notch. Acer also had to get three (yes, three) stickers on the Spin 13. Okay, these are only small niggles, but they matter. There’s a volume rocker on the right edge of the laptop alongside the power button, a status light and a USB Type-C connector. On the left you’ll find an audio jack, a microSD card slot, a full size USB 3.0 port and another Type-C connector. Flip the machine over and you will see two speaker grilles, four rubber feet and a large air vent to cool the Intel processor. The battery-less Wacom pen is tucked away in the chassis itself, underneath the right side of the palm rest. The Spin 13 has the hardware of a mid-range laptop with a fraction of the storage, which isn’t surprising as one of the peculiarities of Chrome OS is its dependency on cloud storage – all Chromebooks get 100GB of Google Drive storage for two years. It is powered by a quad-core Intel Core i5-8250U CPU clocked at 1.6GHz (with an UHD Graphics 620 GPU) and 8GB of LPDDR3 memory plus 64GB eMMC storage. The cheaper Core i3 (i3-8130U) model has only two cores but they are clocked at a much higher speed (2.2GHz). The IPS screen is a highlight, with a QHD resolution spread over 13.5-inches which translates into a pixel density of 200 ppi (for a total pixel count of 3.39 million). Remember that this is over a 3:2 aspect ratio. As expected this notebook does have 802.11ac wireless connectivity courtesy of an Intel part. There’s also a 3-cell, 4.67Ah battery that has a rated 10 hour battery life with a 45W (20v, 2.25A) power supply unit. Acer could have invested a few more dollars to give that anonymous PSU a slightly more upmarket look (similar to what Xiaomi did with its Mi Laptop Air 13.3). As mentioned, the display is the highlight of the Spin 13 despite the glare introduced by the glass overlay. The color reproduction, touch response, general contrast, sharpness and brightness more than make up for any glare issues. Sadly, there’s no HDMI port, so you cannot connect this laptop to an external monitor out of the box, although you should be able to do so via a Google Chromecast. It is likely that it will be limited to Full HD rather than 4K, though. Note that you should also be able to connect via an optional HDMI dongle available from Acer. You can’t turn off the backlight on the keyboard. Speaking of the keyboard, it’s sturdy, with almost no flex, great travel and a good amount of spring. The chiclet design is a tried-and-trusted one, so any Chromebook user will be at home with this device. The touchpad was equally satisfying to use and supports multi-touch gestures; absolutely no complaints here. The Wacom EMR stylus was a real joy to use – a pop-up menu appears every time the stylus is removed from its holder. Remember that this is a basic pen: there are no secondary buttons and no eraser. We didn’t experience any noticeable lag when using the pen (or indeed the Chromebook). Not that we used it to do any hard work, mind you. The laptop lasted a more-than-respectable 7 hours in our YouTube battery test with the brightness set to maximum. As a reminder, we played a 10-hour count-up YouTube video until the Spin 13 switched off due to running out of battery juice. The obvious question is how does this Chromebook compare to a similarly-priced Windows laptop? Acer unfortunately doesn’t have a Windows 10 laptop that is both a convertible and can offer a Wacom digitizer. Is there a missed opportunity here? We think so. Instead, you will find the Acer Spin 3 which has a bigger, Full HD display, quadruple the on-board storage, and a less premium finish. It is also far cheaper at $580 (around £455), a full $300 (around £235) less than the Spin 13. The PixelBook is arguably the model to look up to when it comes to Chrome OS-based devices, and it’s similar to the Surface family on Windows. The equivalent Google Pixelbook, with an older 7th-generation Intel Core processor and no stylus, costs $899 (around £705). You can, of course, optionally buy the PixelBook Pen but it can’t slot into the laptop’s chassis. Neither Dell, HP or Lenovo have Chromebooks that offer the same feature set as the Acer Chromebook Spin 13. The closest rival is the HP Chromebook X2, which features a detachable tablet and a pen – it is much cheaper than the Spin 13 at $500 (around £390) but lags behind on almost all counts. It has a slower processor, less memory, less storage, a keyboard cover that will leave keyboard purists disappointed, and fewer ports. Could this be the best Chromebook on the market for businesses? We’d be inclined to say yes, it is indeed. The Spin 13 is solidly built with the sort of material and finish we’d expect on a premium device. The pen is a bonus and so is the gorgeous display. Add in Android compatibility and the whole-day battery life (just reduce the screen brightness) and you have a stunning product that deserves to be considered. Compared to Windows devices, this Chromebook holds its ground, although the various relative merits of each operating system will probably need to be discussed separately. Should Acer produce a Windows version of this laptop? Sure. Could Acer make a version with both operating systems? Why not?